The Italian American Police Society of NJ is proud to introduce it's 2019 Man of the Year. 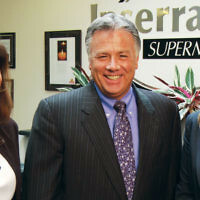 Mr. Lawrence R. Inserra, Jr., also known as Larry, serves as the Chairman, Chief Executive Officer and President of Inserra Supermarkets, Inc. Mr. Inserra serves as Treasurer of Wakefern Food Corp. Mr. Inserra has been a Director of Lakeland Bank Inc. and Lakeland Bancorp, Inc. since January 7, 2016. Mr. Inserra serves as a Director of Shop Rite Supermarkets Inc. and Wakefern Food Corp. He served as a Director at Pascack Community Bank. He has been Chairman of the Board of Governors at Hackensack University Medical Center since 2013 and served as its First Vice Chairman. Prior to Hackensack University Medical University, he served for many years as the Chairman of the Gimbel Multiple Sclerosis Center at Holy Name Hospital. He serves as a Director of Central Bergen Federal Credit Union and the Commerce & Industry Association of New Jersey. He serves as a Trustee of the Community Resource Council of Bergen County. He holds a number of leadership positions, both professionally and philanthropically. He was originally appointed to the medical center's Board of Governors in 1995. Mr. Inserra holds Bachelor of Science in Business and Economics from Lehigh University. We are proud to honor him at our Annual Benefit Gala on Saturday, March 30th at The Fiesta.